Stephen is a doctoral candidate in the field of U.S. History focusing on twentieth-century political and religious history. His dissertation, The Suburbanization of American Catholicism: Postwar Political Realignment and Religious Restructuring, 1945-1980, explores the effects of post-war suburbanization on American Catholicism by examining changes in the dioceses and parishes of metropolitan New York. His research has been published in the Journal of Church and State, U.S. Catholic Historian, and American Catholic Studies. Stephen graduated from The University of Notre Dame in 1999 with a degree in history and theology. In 2006 he earned the Master of Divinity from Notre Dame and was ordained a Catholic priest the following year. Stephen completed an MA in History at The Catholic University of America in 2012. At Columbia he has earned an MA in History in 2014 and an MPhil in 2015. Stephen has been a teaching assistant for undergraduate history courses on American Judaism and the American Presidency. 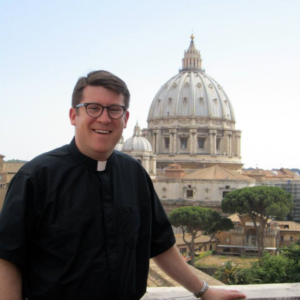 He currently serves as resident priest at the Church of the Holy Trinity on Manhattan’s Upper West Side and as the rapporteur for Columbia University’s seminar on The City.